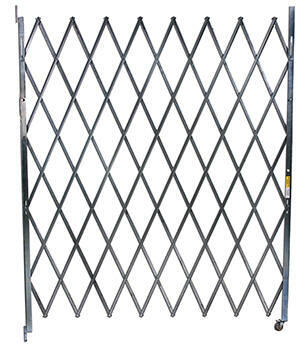 Secure outside access during the day and add security at night with heavy-duty 14 gauge steel folding gates. Durable 2" steel casters allow operator to quickly and fully retract gate when not in use. Center drop pin rests in pre-drilled hole to secure gate when extended. Easy installation! Lock is located on right side on single gates, looking from the outside of the building (lock can be changed to left side, but order needs to be noted of this change). Galvanized for durability. Constructed of steel U-channels riveted back to back using aircraft quality rivets and heavy-duty 1½" x 1½" vertical angles. Contact factory for additional sizes. 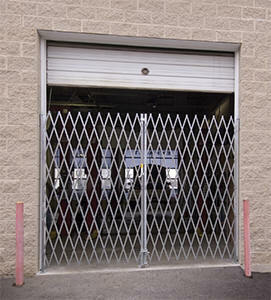 Gates are perfect for many locations; hospitals, schools, and warehouses. Use for blocking equipment, personnel, and entrances. 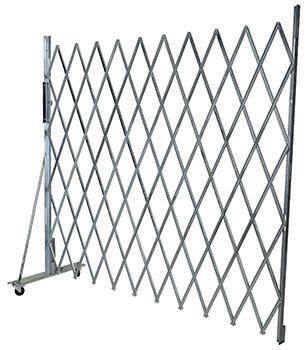 Portable gates expand and lock to close off any opening, which allows for mobile safety and security. When not in use simply fold up, roll away, and store. Purchase optional add-on sections to expand to any distance. Brackets included.